October 30, 2011 — Haunted house attractions are among my pet proofs that actual haunted houses don’t exist. You see, if someone came out and said, “This house is definitely haunted. If you enter, you are guaranteed to see harrowing stuff and things from another world will jump out at you. I would suggest hitting a Dairy Queen, instead,” there would be long lines of excited, cider chugging people wrapped around the block waiting to get in. Haunted house attractions, or haunts as they're often referred to in the industry, are places set up to scare you for money. Kind of like rollercoasters, but with more blood. Unless it's an Action Park coaster, then about equal blood. 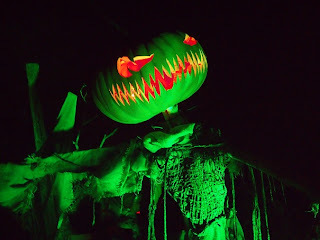 I’ve seen my share of these haunts, from the movie studio quality ones at Universal Studios Halloween Horror Nights in Florida to the high-quality amusement park-level ones like at Cedar Point Halloweekends in Ohio. I’ve been to attractions in New Hampshire and Pennsylvania that have showed up on Top 10 Travel Channel shows. I’ve been to a couple in Virginia that are open year-round. Heck, I even went through one in Maryland that was entirely contained within a single school bus. 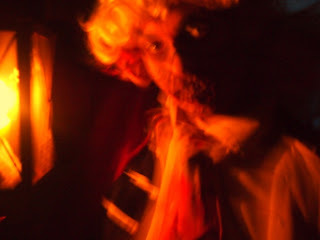 That was the season I attended thirty haunted houses. Just because that’s how the season worked out. I know that sounds like I’m obsessed with them, but in other Halloween seasons, I’ve skipped them entirely. I mean, I feel guilty if I don’t read a Bradbury story or eat a caramel apple during Halloween, but if I miss out on a haunted house, I can still move on to Thanksgiving, no problem. 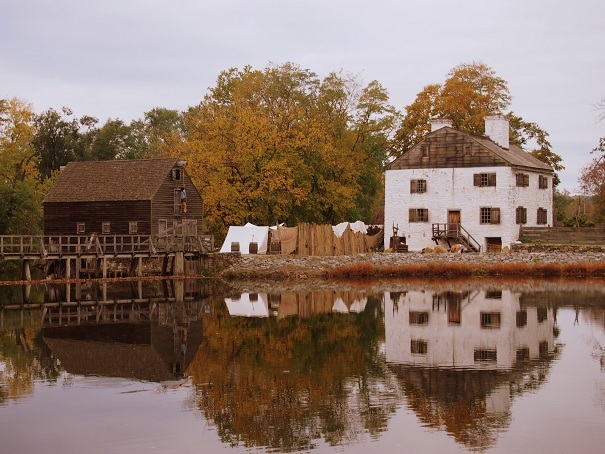 Philipsburg Manor in the daytime. 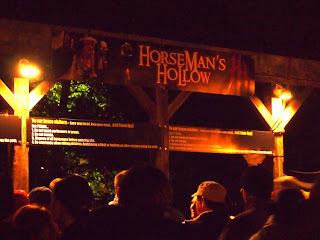 This season, we visited one haunted house attraction, Horseman’s Hollow in Sleepy Hollow, New York. We did this because, well, we were there, and because the other two major events of the night in the area, the Great Jack-O-Lantern Blaze and Irving’s Legend were both sold out. That says a lot of good things about your town’s Halloween cred when your signature haunted house is the last thing to sell out. 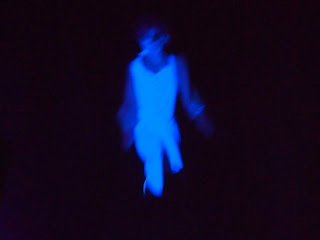 Now, I don’t go to haunted houses for the thrill. Sure, if someone jumps out of at me from the left while I’m looking at a severed head dangling from a hook on the right, I’ll jump. But that’s not why I’m there. I go because I dig the atmosphere, the effects, the effort. Horseman’s Hollow is held at Philipsburg Manor, a 300-year-old farm and mill complex near the Old Dutch Church and Headless Horseman bridge. Even though they still had tickets available, it was only for the first slot at 6:30 and the final slot at 9:30 (like most Sleepy Hollow events, you have to buy tickets in advance). 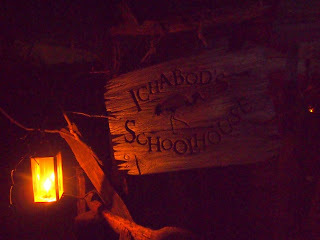 We chose the 9:30 slot because it would give us a chance for some pre-haunt libations, even though we knew that after three hours of spooking, most of the actors would probably be doing more yawning than screaming. The worst thing about any haunted house attraction is the lines, but since they assigned timeslots to groups, this one was managed better than most. Also, I think those libations were speeding time for me a bit. 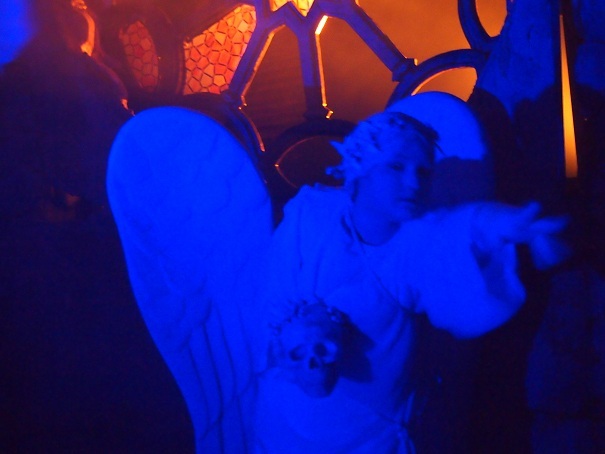 Of course, those group timeslots still encompassed hundreds of people, so that meant they had to send everybody through the narrow path of the attraction in a constant stream of bodies, meaning at no time were we not surrounded by 20 other people. As a result, our chances of being focused on by the spooks, surprised by timed effects, or witnessing the wife run through a fake wall just to get to the end of it all were nil. 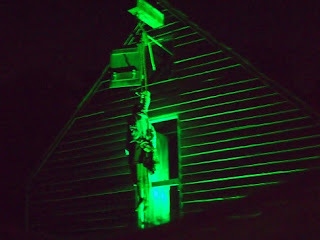 Ideally, haunted houses would only let a few victims in at a time (ideally just one) to maximize the fright, but with a business model that gets only about 10 days to turn a profit (since weekends are often the only time people will got to these things), you need to shunt as many people through it as you can. Still, what it lacked in isolation it made up for in style. 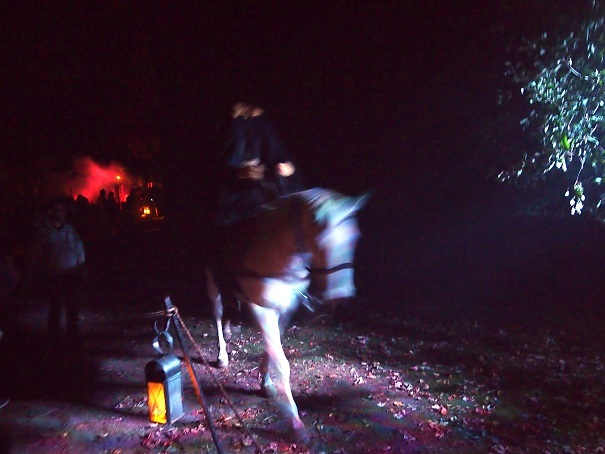 The length was excellent, the spooks varied, the effects toggled between the gory and the classic, and its best feature was that the course alternated between indoor and outdoor areas, including woodland trails. No empty retail space or tent set up in a parking lot for this haunt. And yes, there was a headless horseman on a real horse. You’re a big-leaguer if you’re hiring livestock just to scare people, I assume. I tried to capture pics of the event as best I could. They’re blurry for all the reasons you’d think, extremely dark, too much to drink, and moving at a speed concurrent with the weighty awareness that there are 100 people behind you. In the end, since haunts like these won’t frighten me primally, I just ask that they provide an adventure. Horseman’s Hollow certainly did…at least from what the sambuca lets me remember.